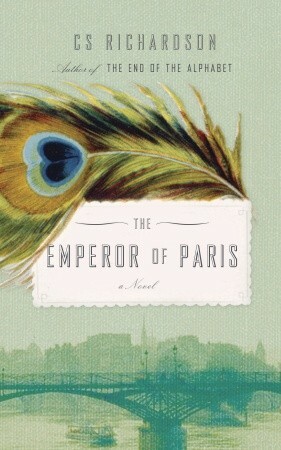 CS Richardson’s The Emperor of Paris is a beautiful book. When I received my review copy, I could barely put it down — the cover, the design on the inside covers and the first few pages are all absolutely beautiful. Kudos to Kelly Hill and Terri Nimmo for such a lovely book design. Richardson’s story, about the circumstances leading up to the meeting and falling in love of an illiterate Parisian baker and a disfigured woman who loves books and art, is similarly beautiful. I do think it’s the kind of story you need to be in the mood to appreciate — Richardson’s words are clearly meant to cast a spell on the reader and transport the reader to an a historical Paris with an almost magical glow. I happened to read my copy in a coffee shop, and while I enjoyed the story and appreciated the author’s craft, I wasn’t quite transported. I think it’s partly because I had been looking forward to the romance between Octavio (the baker) and Isabeau (the woman), but instead the story focused on the lead up to that romance, as well as the stories of the characters around them. So I was disappointed by the limited interaction between the Octavio and Isabeau. Or perhaps I would have appreciated it more if I were in a different environment, one where I could really lose myself in a fairy tale. Richardson’s story reads like a fairy tale. While there are references to the war and to soldiers, the language evokes sensation and a sense of timelessness rather than situates the tale within a specific historical framework. There are figures rather than characters, and even though each person in the story has a quirk or defining characteristic that adds texture, they exist mostly to add to the fabric of their community, and form a lush, colourful mosaic. Storytelling forms a big part of the narrative, and Emperor of Paris is more a love story about storytelling as it is a love story between individuals. Isabeau, born to parents obsessed with beauty and disfigured by an accident at a young age, finds refuge in stories. She loses herself in books, but more than that, she also immerses herself in the beauty of visual art. The paintings in the Louvre themselves have stories to tell, and their beauty provides Isabeau a place behind which to hide her own physical flaws. The significance of storytelling for Octavio and his father and grandfather is even more profound, because their illiteracy compels them to create stories rather than read them. There’s a wonderful moment when Octavio’s father shows him an image from a newspaper of someone getting shot, but then covers the image of the gunman, then asks him what he thinks is happening in the photo. The father-son dynamic in crafting a whimsical tale out of what was originally a horrific image is compelling, and provides one of the most powerful moments in the novel. Octavio’s weekly ritual, later in the book, of going to the Louvre and creating stories from those paintings is both a means to bring him into Isabeau’s world and a touching continuation of a family tradition. It’s a beautifully written book, and, befitting a story so much about the power of storytelling and visual art, it’s also beautifully packaged. I do think the narrative style requires a bit of receptiveness and desire to fall under its spell. I, unfortunately, wasn’t spellbound, but I do look forward to giving this book another try, perhaps in some musty basement archives of an art gallery, or in a sidewalk cafe far from the city, chocolate brioche in hand. This entry was posted in Book Reviews and tagged 50BookPledge2012, Fiction, Random House by Jaclyn. Bookmark the permalink.